PLEASE NOTE: This product is for light users ONLY. If you are an regular user or if you are over 160lbs, then you should NOT be using this product. Important: Avoid all toxins and unnecessary medication for at least 24 hours. 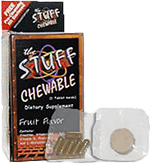 NO food or liquids for 4 hours before using The Stuff Chewable. Pre-Cleanse: For Maximum benefits used the Pre-Cleanse capsule packet the day before using The Stuff Chewable. Take all 6 Pre-Cleanse capsules the day before with 24-32 oz of water.